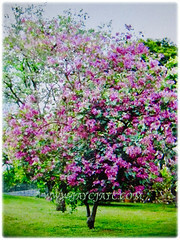 Orchid Tree or Butterfly Tree is admired for its large, showy, fragrant and beautiful orchid-like flowers. Besides, this unique, exotic and free-flowering tree is valuable for its numerous medicinal purposes traditionally. Botanical Name: Bauhinia purpurea (syn. 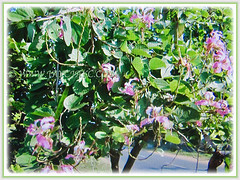 : Bauhinia castrata, Bauhinia rosea, Phanera purpurea). 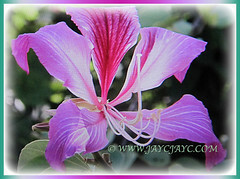 Common Names: Orchid Tree, Purple Bauhinia, Butterfly Tree, Hawaiian/Purple Orchid Tree, Camel’s Foot Tree. Etymology: The genus name, Bauhinia was named after the Bauhin brothers, Swiss-French botanists. The specific epithet purpurea is from the Latin word purpura referring to the purple colour of the flowers. 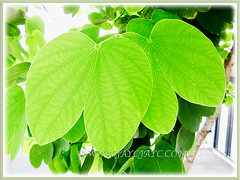 One of its common names, Butterfly Tree is derived from the butterfly shape of the leaves common to many Bauhinia species. Origin: Native to Bangladesh, Bhutan, China, Hainan, Hong Kong, India, Myanmar, Nepal, Pakistan, Philippines and Puerto Rico. It is widely cultivated elsewhere around the world. Plant type: An ornamental and perennial shrub or small tree. Features: Bauhinia purpurea is from the genus Bauhinia that consists of more than 200 species of flowering plants. It is a fast-growing and small to medium-sized deciduous tree or shrub, growing up to 5.2 m tall and spread as wide with drooping branches. Young branches are glabrous. It has a symmetrical and moderately dense crown with a vase or round shape. Twigs are slender, light green, slightly hairy and angled. The 10-20 cm long and broad green leaves are simple, petiolate, base rounded to shallow-cordate as well as deeply 2-lobed at the apex. These leaves are alternately arranged along the stems. Inflorescences are 6-10-flowered raceme in terminal panicles. The showy and fragrant flowers are numerous, hypanthium and coloured purple, pink and purple-marked. Flowers have five narrow petals with 3-4 stamens. Flowers will be followed by 15-20 cm long and 1.5-2.5 cm wide seedpods, coloured brown and strap-shaped. It contains 6-10 shiny brown, glabrous, rounded and flat seeds. Seeds are orbicular, 14-16 mm in diameter and 1-2 mm thick. It’s known to eject its dehiscent seeds as far as 15 m away. 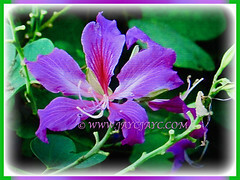 Culture (Care): Bauhinia purpurea or Butterfly Tree can be easily grown with least maintenance. Moisture: Moderate water requirements. Water regularly. It is very drought-tolerant once well established. Soil: Humus-enriched, moist, loamy, acidic and well-drained soils. However, it’s adaptable to any free-draining garden soils. Others: Pruning is needed for strong structure and to develop a uniform shape when it’s young. Occasional pruning during the life of the tree will help maintain a nice, and neat appearance. The flowered shoots should also be cut back after flowering to stimulate the production of new shoots and inflorescences. Feed once monthly with a balanced organic fertiliser for healthy growth and flower production. Generally free from serious garden pests and diseases. Watch out for borers, caterpillars and mites. Also, it is susceptible to leaf spot and leaf scorch diseases. 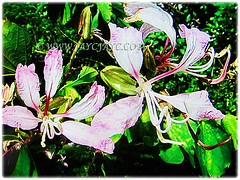 Bauhinia purpurea or Butterfly Tree is a small to medium-sized deciduous fast growing tree that grows well in tropical and subtropical climates. It is very drought-tolerant and actually flowers best on dry soils. In fall, before the leaves drop, the Orchid Tree is covered with countless showy and fragrant orchid-like blossoms in narrow purple, pink and lavender petals. An awesome sight to behold as they create a vivid splash of colour in the autumn landscape. Flowers are followed by seedpods which usually persist on the tree throughout the winter. Propagation: Easily propagated by seeds, grafting, cuttings and and air-layerings. 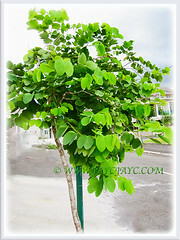 Usage: Bauhinia purpurea or Butterfly Tree with its showy, large and fragrant flowers will be excellent to be planted in public parks and gardens. The spectacular flower display makes this beauty a favourite for specimen plantings. 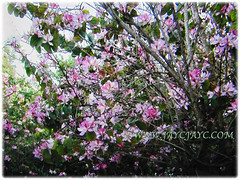 It is widely cultivated as an ornamental tree at parking lot and highway median. The Butterfly Tree is also ideal for erosion control. 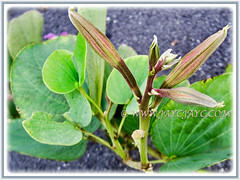 Its leaves, flower, flower buds and young pods are eaten as vegetable with rice. 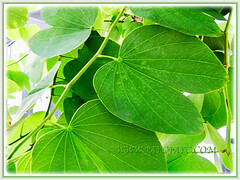 The leaves of the orchid tree are used as fodder for domestic animals like sheep, cattle, goats and buffalo in Nepal. The bark is used for dyeing and tanning Besides, it contains numerous medicinal properties for good health. The Malays use the leaves to treat sores and boils, the flowers are said to be laxative and the bark is used in the treatment of skin disease. It’s also used as a febrifugal, antidiarrhoeal, antibacterial, antioxidants and anti-inflammatory remedy as well as cancer-fighting effects. India, Pakistan and Sri Lanka uses the bark, roots, and flowers in traditional medicine for treating ulcers, wounds, swollen glands and stomach tumours.